he Sanctuary of the Madonna del Colle in the land of Lenola sinks its historical roots to the early centuries of the Christian era, in the middle of the third century. Belgian historian De Schepper, tells us that the Apostles Peter and Paul on the road to Rome along the Via Appia, the "Queen of Roads", which runs through the fertile plain of Fondi, a city of megalithic walls, they preached to the Gentiles the Good News of the Gospel constituting so the first groups of Christians. "Over the following centuries, developed in the area Fondane and its various communities of Christians so that in 250 AD, when Emperor Decius ordered the persecution against them, who thought responsible for the evils that gripped the 'Empire, founded in the territory were killed several thousand. was a result of the relentless manhunt that some of them took refuge in the nearby mountains, not out of cowardice, but with the aim to preserve and spread the seed of the Gospel. One group of persecuted people took refuge on the hill of Lenola, once a rocky and wild, finding refuge in a cave hidden among trees and brambles, where they erected a shrine with the image of the Madonna and Child. There they prayed and celebrated the divine mysteries of the Faith. Some Roman soldiers loyal imperial order to make thorough search in every place, they discovered a small cave where they found the martyrs Honorius and Livio along with others who prayed; killed them all leaving them unburied. The news of the massacre took place on the Hill of Lenola spread among the Christians were founded in the countryside, which informed the Egyptian monaco San Paterno, who was passing through Rome to venerate the tombs of the Apostles Peter and Paul. Having received the news, he went along with other Christians on the Hill, to give a proper burial to the bodies of the martyrs. After the work on sepulcher pious poses a rough stone, with an inscription in language unknown to the pagans: "Here lies Honorius, Livy and others, died for the Faith in the middle of the third century." "Do not fear, hope in God, I am among you for your comfort, here is my picture." Radiant dawn appeared, after thirteen centuries, the night of 15 September 1602. Chosen by the instrumental cause "He who moves all things" is a young man of 23 years: Gabriel Mattei, born in Lenola in 1579. Orphan of parents, lives with his only sister, is a handsome young man, handsome, proud and licentious character. On the afternoon of September 14, 1602, along with two of his friends, he went on the hill of Santa Croce, where once were crucifixes sentenced to death (hence the name of the Holy Cross). On that hill, when Lenola was of the tribe Emilia Roman colony in 319 BC, had erected a pagan temple, that after the advent of Christianity in 313 AD, was dedicated to the Holy Cross. And 'in the Church, rebuilt in its construction, with a rich heritage, as evidenced by the records of 1400, existing in the archives of the Shrine of the Hill, which on September 14, the feast of the Holy Cross, were celebrating Vespers solemn. Gabriel and his two friends, in the churchyard of the Church, began to disrupt the function, a Christian elder came out and rebuked them strongly. The trio hooliganism walked away cursing and railing against the man who had dared to take them back. The fact did not end there, because the three bumbling decided to kill him in the night. Carry out the murder fell to Gabriel. Let friends, Gabriel back into the house, and 'nervous, fights with his sister, not dinner, go to sleep, but did not get to sleep, it's rough. Late at night he gets up, takes her beloved calascione (guitar) of which he was a talented musician, leaves home and goes to a small path on the outskirts of the village, in the moonlight. It sits on a stone and began to touch the strings of the guitar, with the hope that the harmonious sound of the instrument would bring inner peace and serenity. Touches and retouches But, the strings do no emit harmonic modulation. Try to tune it and not it succeeds, it sounds the instrument and 'shrill and discordant, inharmonious as was her spirit. "Stop, do not fear, you call me! Repent, salts this hill, you'll find my picture, I want you to build a temple, and on the day of Consecration'll shine a wonder that over the centuries bear witness to my presence in your country" . The ghignoso Gabriel, became meek lamb, does not come into the house should be set back to the Parish Church of St. John the Evangelist is closed, sitting in the doorway, waiting for it to open and go to pray before the image of Our Lady. His presence in the Church, at that early hour, hardly surprising among the faithful. After the prayer we went to the parish priest to ask for his spiritual rebirth through confession. Reborn by the grace of the Holy Spirit, the new man, go to the appointment, set the previous evening with friends. The impact of these is different from that of the other days, because Gabriel is no longer confident it is calm, gentle, serene and sweet, to see it, so much changed, friends remain baffled, and their question, "You killed him ? "Gabriele with sweet voice and dim tells them what had happened in the night. They do not believe his story labeling it be visionary, cowardly and deceitful. Gabriel, who had to have ascendancy over them invites to go with him to find the image of the Virgin: if this had not come true, they could even kill him. They were convinced, and everyone went home to equip themselves with the necessary tools for the job to be done. All three walked toward the impervious area, making their way through brambles and bushes. 's Work deforestation lasted a few hours without giving results; tired and disappointed they stopped. Encouraged by Gabriel, confident words of the Virgin Mary, went back to work when their eyes appeared the silhouette of an old ruin covered in brambles and ivy, under the green canopy of an age-old cypress. They came, they cleaned the brambles, moss and ivy, and their eyes appeared the image of the Virgin and Child, painted on the wall, blood dripping from his lower lip. At the sight of this prodigy kneel, pray and cry of joyous emotion. At the same time the miracle happened on the Hill, another one takes place within the walls of the town, when a group of children wandering the streets announcing to everyone: "On the Hill was found the picture of Mary on the Hill Let's go." At the announcement of the event made by children, believed many people from all walks of life, who came on the Hill: they saw the miracle of the Virgin and Child, which was dripping blood from his lower lip. After praying and talking to Gabriel and two friends, went back down to race in the country to tell what they had seen with their own eyes. News, sparsasi among the people, reached the ears of the Bishop of Funds, Bishop Comparini John the Baptist who was in Lenola to consecrate the new parish church. Summoned the religious and civil authorities, he asked them to go on the hill to see for themselves what really happened. They spoke with the three protagonists of the discovery and the Bishop informed about the veracity of the event. Subsequently Bishop Comparini after listening to the three young first individually, then together, under oath, he invited them to tell what happened and made them sign a document. September 15, 1602 the Archbishop accompanied by the clergy, civil authorities and by the people , went in procession on the Hill lucky. The bishop went to Image, saw her lower lip still wet with blood and, after having worshiped, makes the Recon prescribed by the Council of Trent. Extract a handkerchief wiped the lip of Our Lady of swollen blood. Handkerchief stained with blood showed it to the people who shouted: "Long live Mary", and sang the Litany of Loreto. Under the right hand affixed the seal of canonical recognition dell'avvenuta reconnaissance, which can still be admired today. Therefore urges the authorities of religious, civil, and the people as soon as possible to build a log cabin that protects the Effigy, waiting to build Temple requested by Our Lady to Gabriel, who will be called the "Shrine of Our Lady of the Hill." At dawn on September 16, 1602, Colle chosen by Mary comes alive with people who came from neighboring countries where even the good news had come. Gabriele and friends are present. It breaks down the age-old cypress tree that for centuries, with its rich green foliage and had somehow protected, dall'intemperie, the image of the Virgin. Gabriele has an inspiration from the branches of the cypress off berries and preserves while others ensure sbancare stones and earth, for the construction of the hut. Everyone feels involved. Built the hut, lit a lamp and descend all, it is already night! The Gabriel reborn back into the house, does not sleep, think back to the request made to him by Our Lady: "I want you to build a temple," How do? Where to find the necessary resources if the population of LENOLA has just 1200 inhabitants. Gabriel is not discouraged, by the grace of the Holy Spirit has a brilliant idea: to become a pilgrim of Mary, walk the streets of the world, narrating his conversion and the desire Asked by Our Lady. Before the start of the pilgrimage risky states to talk to the Bishop Comparini who not only listens, but it encourages and blesses him. Full of enthusiasm, Gabriele fixed for the spring of 1603 the date of his pilgrimage. Gabriel wore the habit, you will fill the pockets of cypress berries, and fell on his shoulders a knapsack and left but not before he had recommended to the good ones villagers to pave the meantime the top of the hill. 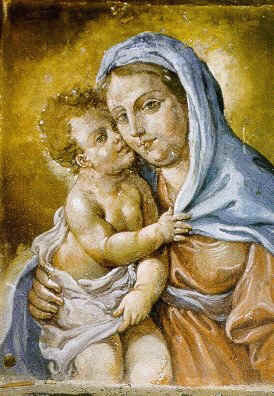 Before leaving, however, was portrayed by the designer Andrea Coti of Catania the image of the Virgin Mary that he brought with him as an emblem. walked across the province, then here it is in Naples, where with an infusion of cypress berries cured a young man of noble family Stigliano. He knocked at every door and was presented with "Deo Gratias "from which came later as the" Fra 'Deo Free ", with whom he has passed into history. traverses the whole of Italy crosses the Alps, he went to France. Spain, in Portugal. His pilgrimage lasts three years. Laden with riches back to Italy. In Rome, the last occurrence was miraculous intervention of his pilgrimage. At the Church of St. Ignatius Jesuit dwelt the noble family Taglietti. Their son was blind. Gabriel heals with the simple washing of the eye with the infusion of cypress berries. Gabriele Lenola back to where they have already begun the work of leveling the shrine, laden with riches. And it has the pleasant surprise to find a large selection of family Stigliano in Naples and an even large family of Rome Taglietti personally brought there by the Jesuit Father Peter Venzi. erection of the temple is now assured. The first stone was laid on May 7, 1607 and September 10, 1610, the Sanctuary that is now called the "Madonna del Colle" opened to the veneration of the faithful. In 1618 it was enlarged in 1620 and was built adjoining the Diocesan Seminary. The proclamation of the sanctuary took place in 1626 with a splash of Urban VIII. Between December 3, 1656 The Deo Gratias, who had dedicated his life to the Shrine and where he lived humbly doing the bell, fell stabbed by three wretches, there, on the threshold of the Shrine . You learned a few days later, on December 8 during the procession in honor of the Immaculate Conception. For a window, a woman exposed the bloody shirt of Gabriel, who had been taken before his burial. A cry of anguish: the killers were there in the crowd and the sight confessed their absurd, inexplicable crime for which they were tried and executed You know their names. But it's worth repeating? Three foolish, punished by men for a crime almost sacrilegious. Maybe it was marked that there, where many Christians had been martyred, including Brother Deo Gratis was himself martyred, was 77 years old. Now resting in the Sanctuary, which he set up in atonement for his errors in burden and glory of the Mother of Jesus.